Should a Twizy be able to charge from a 13amp plug? Availability of public charge points is cited as key to wider take-up, but most electric cars charge most of the time at home, overnight, at domestic power levels (typically 10 amps or 2.2kW for safety reasons), and will continue to do so. An 8 hour overnight charge at 2.2kw puts 14kWh to 16kWh into a typical electric car battery – which is less than 50 miles of motorway driving for a full electric car. This range limits the utility of electric cars, and will slow their adoption as wholesale replacements for existing cars. There is little point in installing low power charge-points in public car parks or long distance transit routes if your goal is to extend the range of an electric car. An 8 hour charge would occupy a dedicated parking spot for far too long to be much use and would limit the utility of the charge points. Low power “commuter” charge points can serve the needs of a 50 miles daily commute, but you need a lot of them at or near the work place. The range for generally affordable electric cars is now 90-100 miles achieved with batteries of 18 to 24kWh capacity. This generation of cars does between 250 and 400 watt-hours to the mile, the higher figure being required for motorway speeds. The most efficient internal combustion engine (ICE) cars use at least twice and in some cases four times that much energy, but typically offer ranges of 500 to 800 miles. Battery powered electric cars will have trouble matching the current range of comparable ICE cars because they are limited by the weight and expense of their batteries. But the range of current electric cars already exceeds the distance many of us drive without a break, and high speed (30 minute) recharging can thus support journeys of indefinite length albeit at significantly reduced average speed. When the charging infrastructure for that is in place – as it arguably already is for the longer range Tesla electric cars – electric vehicles will still be able to enjoy the practical advantage of being able to be at least partially recharged at home over night. Current domestic charge rates of 2.2kW only put back about 50 miles over night, but a 32 amp (7kW) home charge point could fuel over 200 miles (provided the car has a 50kWh battery – currently too expensive for most people). An ICE car fuel tank stores 500 to 600 kWh of energy, which despite its relative inefficiency still provides 3 to 4 times the range. The “Type 2” charging standard being pushed by industry and government in the EU has the flexibility to cope safely and securely with charge rates from 1.3 kW up to 10.3 kW. The UK government is offering a generous subsidy on the equipment and installation cost of these charge points, which means they can often be installed in the home for little or no cost to the consumer. This grant encourages early adoption, so may not be continued indefinitely, but we can hope that all new houses with off-street parking will one day include a Type 2 EV charge point as standard. Doubling the size of the batteries and trebling or quadrupling the rate at which we can recharge them is clearly necessary – though it may not be sufficient – if we are ever to build electric replicas of the cars we have today. And while electric motors are more efficient, the energy required to move a modern car, at modern speeds, and with all modern comforts is ultimately independent of the power source. Electric replicas of modern cars are not, therefore, necessarily going to reduce the amount of energy we need to move ourselves around, particularly if the electricity comes from combustion of fossil fuel either in the car or in a centralised grid-connected power station. If our primary goal is to reduce transport energy usage we can start by encouraging more people to walk to where they need to go if they can, or to cycle if it’s too far to walk. This will also have health benefits, so any smart government will be keen to promote walking and cycling. The UK government seems to have picked up this message, although tying its promotion to elite sports may not be the way to go if your aim is mass adoption. Denmark and the Netherlands do not appear to have built their cycling cultures on the backs of Tour de France victories or Olympic gold medals, high-tech bikes, and lycra-clad cycling clubs. But when it comes to the 85% of personal trips we currently make in our cars that are less than 5 miles – trips where issues such as range, speed, and overall comfort are less important than absence of effort – there are already very low energy electric transport solutions available. And by very low energy we mean a fraction of the energy cost per passenger mile of even an electric car. The electric bike – a thriving market and industry in other European countries – offers a way to get about with an acceptable level of effort for many people. Take-up of electric bikes in the U.K., and government promotion of them, has been disappointing (although it may be improving – helped by imports of bikes and technologies from countries with far fewer cycling golds than the U.K.). An electric bike uses a hundredth of the energy of a regular passenger car (less than 10 watt-hours per mile) and is fine for most people for round trips of 5 miles or so. But if the effort required to propel even an electric bike is too much, or the speed is too low, the electric scooter or motor bike offers effortless travel at much higher speed and for longer distances of up to 40 miles at an energy cost of less than 50 watt-hours per passenger mile. The Renault Twizy, a particular favorite of ours at the moment, manages to move one person at less than 100 watt-hours per mile, and with its full complement of two people at an energy cost comparable with mass-transit systems like the London Underground. It can do about 50 miles when driven at moderate speed. This mean that it only needs a 6kWh battery which makes it very light and contributes to its energy efficiency. It also means that it can re-charge, fully and safely, from a regular domestic power point. An electric car, if it hopes to replace a petrol or diesel one, must offer 4 seats, luggage space, full weather protection, motorway speed and modern car comfort. This cannot be delivered for a fraction of the all-up energy cost of a modern car, which are as efficient as we know how to make them. The conversion efficiency of electric motors does give electric and hybrid cars an energy advantage, but a vehicle that only has to carry you a fairly short distance with limited protection from the weather – offering the facility of a door-to-door bus – can do much better. Vehicles like the Twizy do not, by definition and design, do everything that a modern car does. If you need something that does, you will need to buy a proper car (and today, that won’t be an electric car if you really need a car that does everything a modern car can do). The Twizy, and ultra low energy vehicles like it, do not attempt to replace a car. What they can do is replace a large proportion of car journeys, a third to a half of car miles, while reducing the energy used for personal transport by at least a half. No-one has so far suggested (I hope) that electric bikes, scooters and motor bikes need special charge points. They have small enough batteries that they can be safely re-fuelled from regular domestic sockets. A Twizy can also re-charge itself adequately over lunch (and easily over night) from a domestic power point, which makes it easier to buy and use. It is still expensive, but even so is half the price of the cheapest electric car without the benefit of a £5k government subsidy. It makes a good “second car” replacement even though it clearly isn’t a car, and can dramatically reduce transport energy consumption by providing the minimum necessary for effortless local travel. 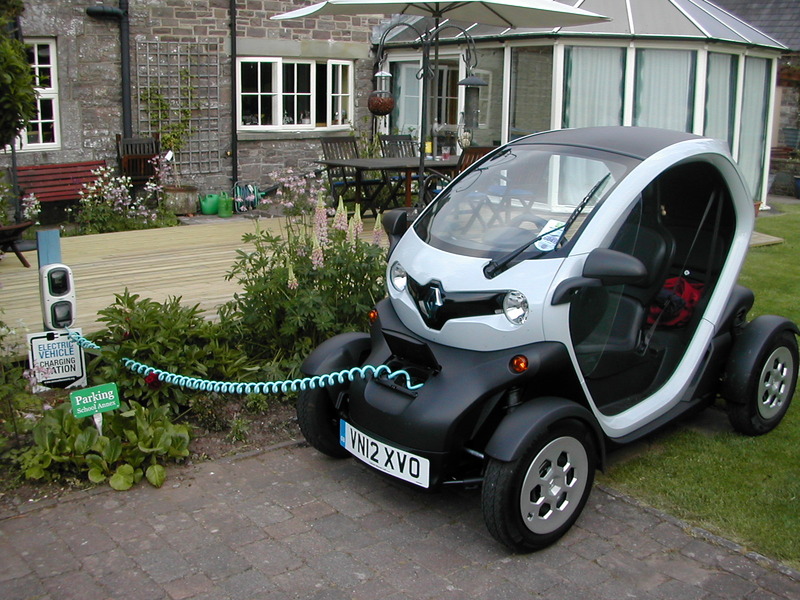 We would like to see producers of the Twizy, and vehicles like it, encouraged to continue to minimise their energy use. Designers of electric cars trying to fully replicate conventional cars will have to find ways to increase the capacity and power of their batteries. and high speed, high power charge points will be absolutely necessary for them to succeed. When we install a full high power charging infrastructure, we can be fairly sure that electric car designs will evolve to use them to the full, with larger batteries supporting higher energy consumption on the essentials of modern car travel. So to encourage the development of very low energy personal travel vehicles, perhaps we need to allow, or even restrict, them to re-charging from normal domestic power points at domestic power levels. This will force their designers to find ways of getting more miles out of limited batteries, and drive up the fuel efficiency of what will be a different class of personal transport vehicle. Unlike mainstream electric cars, these vehicles will not set out to replace or to replicate today’s cars, but they could replace the most energy-costly car journeys, and deliver far greater reductions in transport energy usage than simply replacing petrol cars with electric equivalents. 2 Responses to Should a Twizy be able to charge from a 13amp plug? At that low speed, a Twizy would do 80 km on a charge or go for >2.5 hours. The top speed of a Twizy is 80 km/h but if you do that speed, it will only go about 50 km.